Royal Worcester was given its Royal Warrant in 1789 by King George III, allowing use of the Royal Coat of Arms and the words ‘Manufacturers to their Majesties’.The company retains this warrant today. The actual origins of the company was 38 years earlier in 1751. Pictured right: Wigornia Creamboat c1752 considered one of the rarest pieces of Royal Worcester Porcelain – known as Wigornia creamboats after the Roman name for the city of Worcester, they were among the very first pieces made by the Worcester porcelain factory. This version sold for $87,817 at Bonhams in 2006. According to the Worcester Porcelain Museum the exact sequence of events which led to opening of the factory is not known, but it seems that around 1750 Dr.John Wall (1708 – 1776) and the apothecary William Davis conducted some experiments at Davis’s shop in Broad street, Worcester and discovered a method of making a porcelain type material. They then persuaded a group of 13 local businessmen to back their discovery with investment in a new factory at Warmstry House. A lease for the grand house on the banks of the River Severn was taken out on 16th May 1751 and on the 4th June, the 15 partners signed a deed to officially establish the ‘Worcester Tonquin Manufacture’. A year later the company acquired Benjamin Lund, a rival business in Bristol and with the acquisition gained valuable expertise in the manufacture of porcelain which was to help its early development. Early wares were functional and included the best English blue and white porcelain tea wares as well as more expensive enamel sets. Increased tea consumption during the late 18th Century led to a huge demand for teawares and with it prosperity for the Worcester factory. Other artistic influences in the mid-late 1800’s included everything Oriental and the influence of Meissen Porcelain. New wares and techniques in the period included Rococo style pieces, the invention of printing on porcelain from engraved copper plates by partner Robert Hancock, and Worcester’s famous Scale blue porcelain in the 1760s which used underglaze blue backgrounds with a high standard of gilding and enamelling. Dr Wall retired in 1774 leaving William Davis as sole manager of the Worcester factory. The factory continued to improve and expand and in 1783 Thomas Flight bought the Worcester factory, for his sons Joseph and John. In the same year Robert Chamberlain who was head of the decorating department at Warmstry House, left the company to start his own porcelain decorating business in nearby King Street, Worcester. 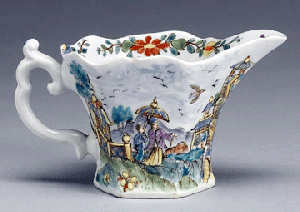 The Chamberlain factory quickly established an en viable reputation for the production of finely painted porcelain and its patronage included Admiral Lord Nelson and Lady Hamilton. A new factory was created in Severn Street where the company still operates today. The two Worcester companies merged and joined forces in 1840 under the name of Chamberlain & Company. In 1851 the last of the Chamberlain family, Walter, retired, leaving the factory in the sole charge of the Dublin business man, William Kerr, who was to dramatically change the fortunes of the company during the 1850’s. New techniques, modern machinery improved the quality of product in every department. New company products included The Shakespeare Dessert Service, an example of restrained Classical design, used a combination of new materials, Parian for the figures and white bone china. 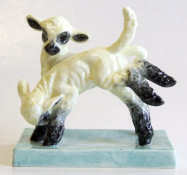 Parian, a new type of porcelain received great attention when first displayed at the London, Great Exhibition of 1851. The new material imitated marble, which was mined in Paros, Greece. Introduced at Worcester in 1853, Parian only needed one firing to produce a cleanable material with a matt finish. Parian was used to make small versions of Classical sculpture at an affordable price and was in great demand by the new middle classes. 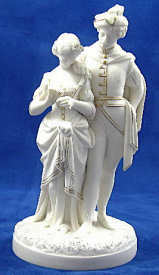 Many sentimental and moral subjects were popular alongside National Heroes and characters from mythology.Worcester also produced Ivory Porcelain (glazed Parian) from 1856 that imitated carved ivory. Another key development for the period was the creation of Worcester Enamels by Thomas Bott. Bott was inspired by enamel work on copper from Limoges, Franc. In 1854 his work was admired by Prince Albert and the following year a display at the Paris Exhibition received excellent reviews. In 1859 Queen Victoria ordered a dessert service to be decorated with Worcester Enamels. A special turquoise background was used and the new ‘Queen’s shape’, with pierced panels was deigned by Thomas Reeve. Drawings of the Vatican Loggia by Raphael inspired the enamel decoration by Thomas Bott and a unique factory mark was created for the service by Digby Wyatt. Josiah Davis applied the most complex chased gilding ever used and the service re-established the reputation of the Worcester Royal Porcelain Works after many troubled years. In 1862 W.H.Kerr returned to his native Ireland. Under the leadership of Richard Binns, having established new materials, bodies and glazes and trained new staff the factory was set to climb to new heights as Royal Worcester. In the period from 1851-1887 the Severn Street factory expanded from 70 to 700 employees. The factory concentrated on figurines and vases and introduced 2500 new decorative items between 1862 and 1900. The first piece of Royal Worcester Painted Fruit was painted by Octar Copson in 1880 – this prestige range continues to be produced today. The early 20th Century saw the local Grainger Worcester factory closed and the workforce move to Royal Worcester in 1902 and in 1905 Hadley & Sons was also acquired by Royal Worcester. 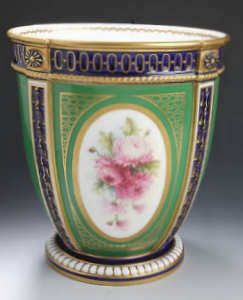 Georgian style interirors were fashionable and Royal Worcester produced new versions of many old Worcester designs in Georgian style popular patters for the period included coloured flower borders, Willow pattern, and Blue Dragon. 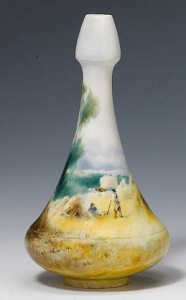 Around 1900 Royal Worcester allowed the painters to sign their work for the first time. (The signature usually appears on the edge of the painting, not on the bottom of a piece) The artists were encouraged to specialise and develop individual styles, they all collected cuttings, photographs and postcards, which the y often worked from. After the First World War there was a move towards modern functional tableware and Royal Worcester introduced several new styles including boxed coffee sets, bowls for floating flower heads and lampshades in geometric designs were chic new ideas. Printed linear tableware patterns, enamelled by hand were also developed. China patterns had always been given numbers by the factory, but for the first time in the mid 1920’s china tableware designs were given names such as Marjorie, Lady Evelyn and Duchess. Royal Worcester also produced more extravagant china mainly made for export. Richly gilded patterns such as Imperial designed by Harry Davis (1885 – 1970) in 1911 and Embassy designed by John Wadsworth in 1916 were especially popular in the USA. Tiffany of New York sold rich service plates that were embellished with hand gilded acid etched patterns. However, the 1920’s saw a downturn in the world economy and Royal Worcester narrowly escaped closure and was rescued by Charles Dyson Perrins who bought the company outright in the early 1930’s. 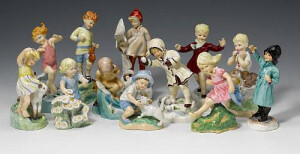 All forms of earthenware and glazed Parian were discontinued in 1931 and in the same year under the Royal Worcester launched a new range of bone china figures. In 1933 an American publisher encouraged Royal Worcester to make Limited Edition bird models for the American market. Post World War II Royal Worcester produced a number small decorative figures by artists such as Eva Soper, Agnes Pinder Dabis and Doris Lindner. The popularity of these designs led to many more series in the 1960s and beyond. The 1960’s also saw the introduction of one of Royal Worcester’s most popular patterns Evesham (so named after the local fruit-growing region near Worcester). This was created by Robert Baker, Professor of Ceramics at the Royal college of Art, and two of his pupils in 1961. The company celebrated its 250th Anniversary in 2001 which fittingly included a visit from Queen Elizabeth II and the Duke of Edinburgh. 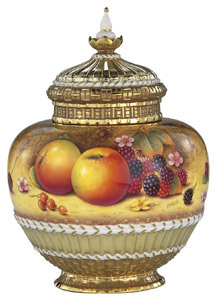 Royal Worcester’s rich heritage and tradition continues today and it still produces one of its most prestigious ranges the hand painted Painted Fruit. Royal Worcester still produces one-off bespoke dinner and tea services and ornamental items and its porcelain and bone china can be found in hotels and institutions throughout the world including Clardiges, Raffles and Tiffany’s.